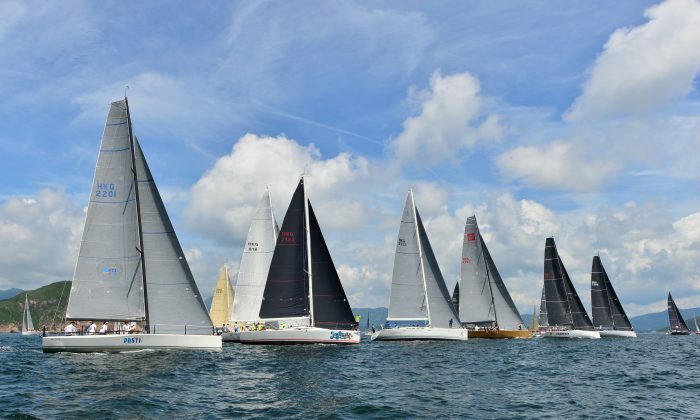 Hong Kong—The annual Mirs Bay Passage Race part of the Quest Yachting Typhoon Series, took place last Saturday Aug 2, 2015. In Light wind conditions Race Officer, Bob Vart, started the race from outside Port Shelter to obtain more breeze, but still only found a light wind of 6.5kt for the 62 boats covering seven race categories. IRC—In IRC Division-A, “FreeFire” was first to reach the finish but series leader “Zannekin” won on corrected time with “EFG Mandrake” 2nd and “Vineta” 3rd. “FreeFire” finished in 6th place. In IRC-B, “Lighthorse” took line honours and first place with “Sea Wolf” 2nd and “Blackjack” 3rd. “Dexter II” continued her winning form winning IRC-C, with “Gearbox” 2nd and “Gambit” 3rd. HKPN—”Getafix”, “DEA II”, and “Temujin” were the 1, 2, 3 in HKPN-A, and the unusual line up of “Scrumpy”, “White Dragon” and “Geko” took the first three places in HKPN-B. J80—”Footloose” took first place, “Jive” came second, “JeNa PaBe” was 3rd and “Bumphead” was 4th. Sportsboats—”BRACE BRACE BRACE” flew to a shortened finish line in 2:26:13 to take first place ahead of “Merlin” in the Sportsboat Division with “Sidewinder” 3rd. Sportsboats: “Merlin” (7), “Sidewinder” (15), “Brace” (35), “Stingray” and “Black Magic” (41). This coming weekend on Saturday Aug 8 will be the last race day of the 2015 UK Sailmaker Summer Saturday Series. The next race-day for the Quest Yachting Typhoon Series is on Sunday August 16, 2015.